The tendencies of convergence academic and vocational (authorized) education. Nowadays there is an active reforming of the IT educational systems which in many respects is caused by the aspiration of the representatives of the business-community to reduce the expenses and time of the adaptation of graduates as much as possible for the performance of the industrial activity and the subsequent improvement of the professional skill as employees. For the decision of this problem many companies create special curriculum of the authorized training and corporate universities which prepare experts for the particular activity as much effectively as possible. At the initial stage of the development of the authorized training such an approach was effective enough, however for today a lot of factors have led to the situation when the academic and professional (authorized) training are strongly crossed and define a negative economic effect: the necessity "to pay twice ". Being guided by the positive domestic and foreign experience of the cooperation of the academic community and the industry, Educational and Methodical Department of the polytechnic university education in Russia and the Microsoft Company have organized the project on the harmonization of the processes of the modification of the maintenance of the IT- curriculum. One of the first problems of this project is the adaptation of the authorized course manuals, matching them with the requirements of the Educational and Methodical Department and the Ministry of Education and sciences of the Russian Federation. Integration of the educational and methodical base is a key problem on the way of a mutual recognition the academic and vocational (authorized) education. Quality of educational and methodical, personnel, financial, material, organizational and normative resources. Shortage of the qualified experts on extraction and structurization of knowledge. A specially prepared staff such as engineers on the knowledge who own additional pedagogical and methodical competences is necessary for the extraction and formalization of knowledge with the purpose of the definition of the requirements and maintenances of the educational process. The existing deficiency in the similar staff makes the use of alternative sources of knowledge expedient. These are educational and methodical complexes; their structure can serve as a pattern, a starting point for the formation of the system of knowledge, skills and personal characteristics of the experts and students. Technology of introduction MOACs in IT curriculum of High Education. Preparation of recommendations from the EMD. Key results of the Project . Educational and methodical complexes (EMC) are an integral component of the content of the quality of the education. The existing tendencies to an active use of the technologies of the e-learning and blending learning, and also the universal transition to the concept of the knowledge management make EMC the basic and dominating component of the educational process. In this connection the integration the educational and methodical base of IT-specialties of the higher education and vocational (authorized) courses of IT- vendors is the effective mechanism to convergence of the academic (high school) and vocational (authorized) educational and training. The competence approach, technologies of the knowledge management, concepts of continuous training and a mutual recognition of the education on the basis of credits are the methodological basis of integration, and in the long term, convergence of the educational and methodical base. In the framework of the project "Introduction of the official educational and methodical resources of Microsoft into the educational process of IT-specialties of the higher education" the methodic of the adaptation and introduction manuals on IT-vendors authorized courses in the educational process of IT-directions of the higher education is offered. Its approbation is executed on the basis of the “MOAC: Managing and Maintaining a Microsoft Windows Server 2003 Environment (70-290)”, corresponding one of the most mass and demanded courses in the field of the IS administration. The most popular and prestigious directions in the field of IT have been chosen as the target curriculum of the higher education. They are “Information systems”, “Informatics and Computer science” and specialties concerning them. The analysis of the manual has shown a high methodical level of the study of the materials (a good structurization of the text, a presence of the control questions, a description the target competences, a wide end matter, etc.) and their great value for the purchase of practical skills. Also a number of restrictions and potential opportunities for the perfection of the manual are revealed. One of them is that MOAC in many respects keeps the characteristic features of its prototypes such as authorized courses MOC (Microsoft Official Course) which are directed in a greater degree on a training of practical skills under an instructor’s supervision, instead of the development of the knowledge and the skills, which mean a profound and independent studying of various theoretical aspects. The urgency of the specified restriction is connected with the fact that in the requirements of the state educational standards to the contents of the disciplines theoretical questions are mainly considered. At the same time the absence of instructions for practical skills cannot be considered as advantage and should be compensated. Partially this problem is carried out with provisional programs of disciplines, but in the long term this problem can be solved more successfully with competence models and curriculum , made as MOAC manuals. Such integration can be a good base for the creation of the balanced competence curriculum and models. By comparison of the contents of the manuals and the requirements there is a problem since the existing normative documents in the educational sphere do not regulate the depth of the studying of different disciplines, leaving this question for universities. On the one hand it leads to the situation where there is no formal obstacle for the recommendation of the manual on a concrete discipline irrespective of depth of disclosing of subjects of a corresponding subject field. On the other hand, at the attempt of a real estimation and comparison there is nearly always exist the need for the mechanism or the tool for differentiation of the material’s complexity and the target competency levels. Unfortunately, the EQF (European Qualification Framework) cannot be used directly for the decision of this problem since it is focused on educational levels. However its prototypes ? the systems of accumulation and transfer of credits (CATS) in Great Britain which allocate eight levels of the complexity of disciplines can form a basis for the further study of this question. The results which have been received in the framework of the project allow analysing the opportunity of the creation of the integrated curriculum. Their tracks includes studying both academic, and the authorized courses. The integration can be carried out at a level of the modules of the disciplines, a set of the competence, a step or a structure of education. 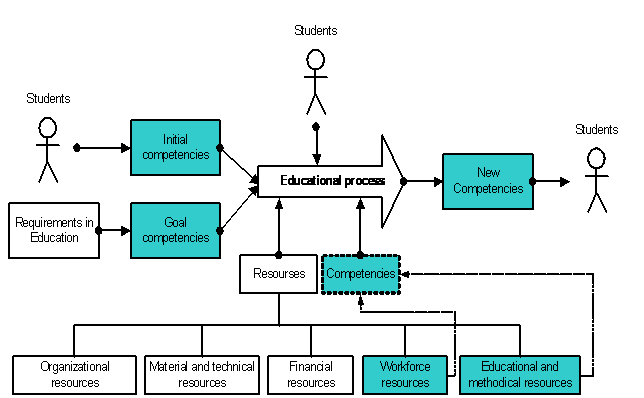 Methods for the formation of competence models of the state educational standards and provisional curriculum which can be used for the creation of a new generation of educational standards are developed. The experience of reviewing of textbooks and manuals is generalized, the general recommendations are made , typical mistakes and lacks are systematized. Methods of crediting (calculation credits) are offered for the estimation of labour intensiveness of the studying of the authorized manuals and courses. 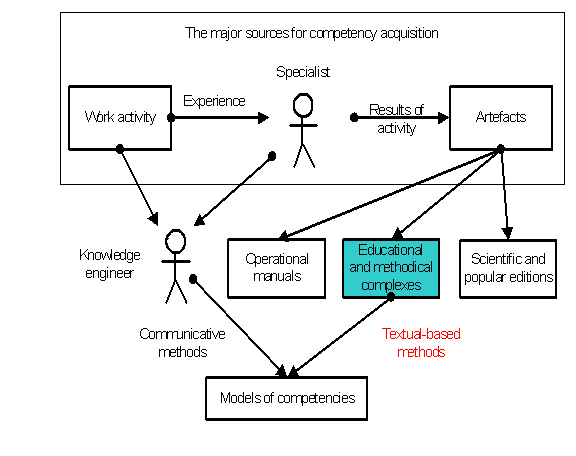 The received results represent one of the best practice of the use of the competence approach for the decision of the problems of the integration of education systems, and the offered concepts and developed methods can be recommended for the perfection of accreditation (stamping) procedures and estimations of the quality of the educational literature. Application of a technique for a group of MOAC manuals, the revealing the features of fascicles, the account of their coherence in a series and optimization of the developed methods. Use of the received results as a methodological basis for the integration of other components of the authorized training system: tests, certifications, specialized programs (for example, Microsoft IT Academy), etc. Convergence the educational and methodical base by the creation of a new class of the manuals which are meeting the requirements both the academic, and the vocational community. Duplicating of the received results and creation of the best practice in high schools for various directions and specialties of preparation. Providing the license software delivered in educational institutions, MOAC manuals with a Microsoft recommendation and a accreditation (stamp) of educational and methodical associations. Realization the project of supply the universities libraries with the modern literature recommended by educational and methodical associations and business-community.